1 A None No Power Seat 1 A is an Economy Class seat that has extra legroom however, unlike most bulkhead seats, does not have a tray table. There is no floor storage during take-off and landing. The first overhead bin is often used for equipment storage. 1 B None No Power Seat 1 B is an Economy Class seat that has extra legroom however, unlike most bulkhead seats, does not have a tray table. There is no floor storage during take-off and landing. The first overhead bin is often used for equipment storage. 1 C None No Power Seat 1 C is an Economy Class seat that has extra legroom however, unlike most bulkhead seats, does not have a tray table. There is no floor storage during take-off and landing. The first overhead bin is often used for equipment storage. 1 D None No Power Seat 1 D is an Economy Class seat that has extra legroom however, unlike most bulkhead seats, does not have a tray table. There is no floor storage during take-off and landing. The first overhead bin is often used for equipment storage. 1 E None No Power Seat 1 E is an Economy Class seat that has extra legroom however, unlike most bulkhead seats, does not have a tray table. There is no floor storage during take-off and landing. The first overhead bin is often used for equipment storage. 1 F None No Power Seat 1 F is an Economy Class seat that has extra legroom however, unlike most bulkhead seats, does not have a tray table. There is no floor storage during take-off and landing. The first overhead bin is often used for equipment storage. 10 A None No Power Seat 10 A is an Economy Class seat that may not recline due to the exit row behind. The window is misaligned at this row. 10 B None No Power Seat 10 B is an Economy Class seat that may not recline due to the exit row behind. The window is misaligned at this row. 10 C None No Power Seat 10 C is an Economy Class seat that may not recline due to the exit row behind. The window is misaligned at this row. 10 D None No Power Seat 10 D is an Economy Class seat that may not recline due to the exit row behind. The window is misaligned at this row. 10 E None No Power Seat 10 E is an Economy Class seat that may not recline due to the exit row behind. The window is misaligned at this row. 10 F None No Power Seat 10 F is an Economy Class seat that may not recline due to the exit row behind. The window is misaligned at this row. 11 B None No Power Seat 11 B is an Economy Class seat that has extra legroom due to the exit row in front, but limited recline due to the exit row behind. This seat is less padded than other seats on this aircraft. The tray table is on the seat back in front of you, which can be a bit far away for shorter passengers. It can get very cold by the exits during flight. As this seat is part of the only twosome on the plane, it is ideal for those passengers traveling with a partner. 11 C None No Power Seat 11 C is an Economy Class seat that has extra legroom due to the exit row in front, but limited recline due to the exit row behind. This seat is less padded than other seats on this aircraft. The tray table is on the seat back in front of you, which can be a bit far away for shorter passengers. It can get very cold by the exits during flight. As this seat is part of the only twosome on the plane, it is ideal for those passengers traveling with a partner. 11 D None No Power Seat 11 D is an Economy Class seat that has extra legroom due to the exit row in front. This seat is less padded than other seats on this aircraft. The tray table is on the seat back in front of you, which can be a bit far away for shorter passengers. It can get very cold by the exits during flight. 11 E None No Power Seat 11 E is an Economy Class seat that has extra legroom due to the exit row in front. This seat is less padded than other seats on this aircraft. The tray table is on the seat back in front of you, which can be a bit far away for shorter passengers. It can get very cold by the exits during flight. 11 F None No Power Seat 11 F is an Economy Class seat with extra legroom due to the exit row in front. This seat is less padded than other seats on this aircraft. The tray table is on the seat back in front of you, which can be a bit far away for shorter passengers. It can get very cold by the exits during flight. This window seat has a slightly downward tilt which can be uncomfortable. 12 A None No Power Seat 12 A is an Economy Class seat that has extra legroom due to the missing window seat in the row in front. 12 D None No Power Seat 12 D is an Economy Class Exit Row seat that has extra legroom. 12 E None No Power Seat 12 E is an Economy Class Exit Row seat that has extra legroom. 12 F None No Power Seat 12 F is an Economy Class Exit Row seat that has extra legroom. 23 A None No Power Seat 23 A is an Economy class seat towards the rear of the plane. Some passengers find seats at the rear of the plane to be much colder than other seats on this plane. 23 B None No Power Seat 23 B is an Economy class seat towards the rear of the plane. Some passengers find seats at the rear of the plane to be much colder than other seats on this plane. 23 C None No Power Seat 23 C is an Economy class seat towards the rear of the plane. The close proximity to the galleys may be bothersome as this seat is often bumped by attendants or service carts passing by. Some passengers find seats at the rear of the plane to be much colder than other seats on this plane. 23 D None No Power Seat 23 D is an Economy class seat towards the rear of the plane. The close proximity to the galleys may be bothersome as this seat is often bumped by attendants or service carts passing by. Some passengers find seats at the rear of the plane to be much colder than other seats on this plane. 23 E None No Power Seat 23 E is an Economy class seat towards the rear of the plane. Some passengers find seats at the rear of the plane to be much colder than other seats on this plane. 23 F None No Power Seat 23 F is an Economy class seat towards the rear of the plane. Some passengers find seats at the rear of the plane to be much colder than other seats on this plane. 24 A None No Power Seat 24 A is an Economy class seat in the last row of the plane. Some passengers find seats at the rear of the plane to be much colder than other seats on this plane. The close proximity to the galleys and lavatory behind may be bothersome. 24 B None No Power Seat 24 B is an Economy class seat in the last row of the plane. Some passengers find seats at the rear of the plane to be much colder than other seats on this plane. The close proximity to the galleys and lavatory behind may be bothersome. 24 C None No Power Seat 24 C is an Economy class seat in the last row of the plane. Some passengers find seats at the rear of the plane to be much colder than other seats on this plane. The close proximity to the galleys and lavatory behind may be bothersome. 24 D None No Power Seat 24 D is an Economy class seat in the last row of the plane. Some passengers find seats at the rear of the plane to be much colder than other seats on this plane. The close proximity to the galleys and lavatory behind may be bothersome. 24 E None No Power Seat 24 E is an Economy class seat in the last row of the plane. Some passengers find seats at the rear of the plane to be much colder than other seats on this plane. The close proximity to the galleys and lavatory behind may be bothersome. 24 F None No Power Seat 24 F is an Economy class seat in the last row of the plane. Some passengers find seats at the rear of the plane to be much colder than other seats on this plane. The close proximity to the galleys and lavatory behind may be bothersome. 8 F None No Power Seat 8 F is an Economy Class seat that is missing a window. In March of 2012 Southwest began reconfiguring their 737-700 fleet to increase their seating capacity from 137 seats to 143 seats. These newly reconfigured aircraft will also feature the new Evolve Interior with silmline seats. Their Evolve Interior is an eco-friendly design that is part of Southwest's commitment to be a "green" airline. Southwest has retained the "Innovator II" seat frames and added fixed wing head rests, along with a newer and thinner foam fill. This seat has a reduced recline from 3" to 2", in comparison to the older versions of this aircraft; however this loss is compensated for as you are sitting at a different angle and this seat design should naturally recline your body to prevent the feeling of "needing to recline". Some passengers of the new 73G Evolve product have found this new configuration to be much less comfortable however due to the change in seat pitch from 32", down to 31". The issue doesn't appear to lie with the seats themsleves, but with the overall feeling of cramped seating. Having read several dismal reviews of poorly-padded seats barely good for 2 hr MAX flight, I approached my 5 hr flight to Costa Rica with some trepidation. Perhaps because the seat coverings looked very new (and thus were recent additions), the sitting was quite comfortable on this flight, Seat 2F nicely aligns the window and seat back so your shoulder fits into the window recess, to rest your head on the wall for snoozing. I'm an average size (5'11', 185 pounds) male so the seat dimensions did not confine me. I'd happily take this seat again. Unless you absolutely require the keg room, I’d avoid this row sue to lack of tray table. Also nothing can be stowed beneath seat. 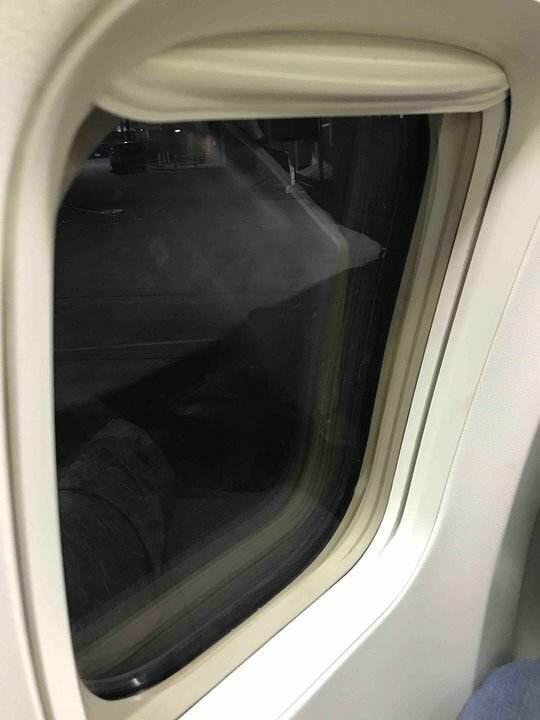 If you sit in a window seat on either side of a 737, behind row 5, you can observe that the curvature of the fuselage for the nose of the aircraft starts to converge at row 3 on both sides of the airplane. This convergence by the time it reaches row 1 has eliminated approximately 1-1/2" from the width of the window seat. While an unfilled flight presents no issues, once the front row has three passengers on each side, the narrowness of the window seats in the first three rows can really be uncomfortable. Another suggestion is to look at the trim surrounding the windows in each aisle. Try to get a window seat that has your shoulders able to take advantage of the extra space at the window well for your shoulders. That helps on a crowded flight. First (and last experience with Southwest). Seat width says 17", but I have traveled on other aircraft with 17" wide seats and never been this uncomfortable. Large person in middle seat meant I was pushed over aisle. It seems like the aisle is wider so the seat widths have to be narrower. I'm sure that aisle width helps load and unload plane faster, but at the expense on any comfort one finds in coach. This airline isn't building planes for comfort, it's how many people they can squeeze into these planes. I guess that's the trade off low fare tickets for comfort. I was sitting in a aisle seat and had to lean over toward the aisle but was still touching the person next to me. I would rather drive than fly any day. 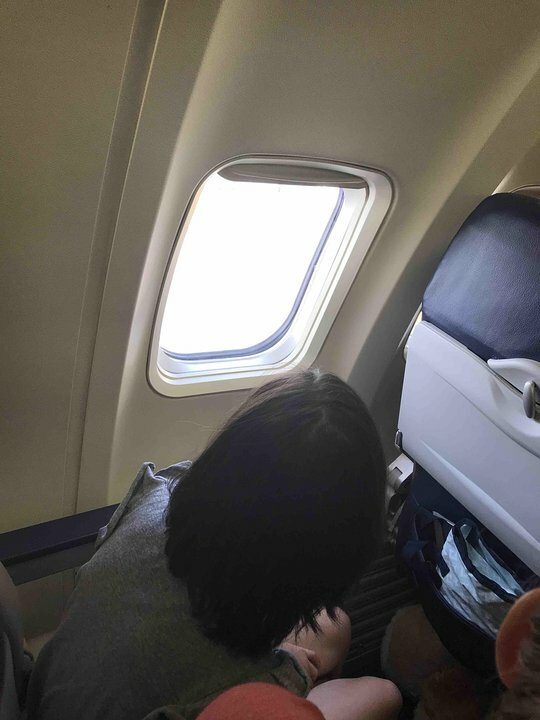 for those of you that have broad shoulders, the window indent in 18A lines up almost perfectly with the seat back, giving your shoulder an extra couple inches of shoulder room. The seats have NO MORE THAN 29 INCH SEAT PITCH, the seats are only as wide as 17 inches, NO MORE than 17 and the most turbulent flight i have ever taken in my life. I WILL NEVER FLY SOUTHWEST AGAIN! I for one, do not like South West's 'new' configuration for the 700 series. These days, 31" pitch is normal for crossing the Atlantic, let alone a domestic USA flight. The older 737's had 32' itch and that made all the difference to me. 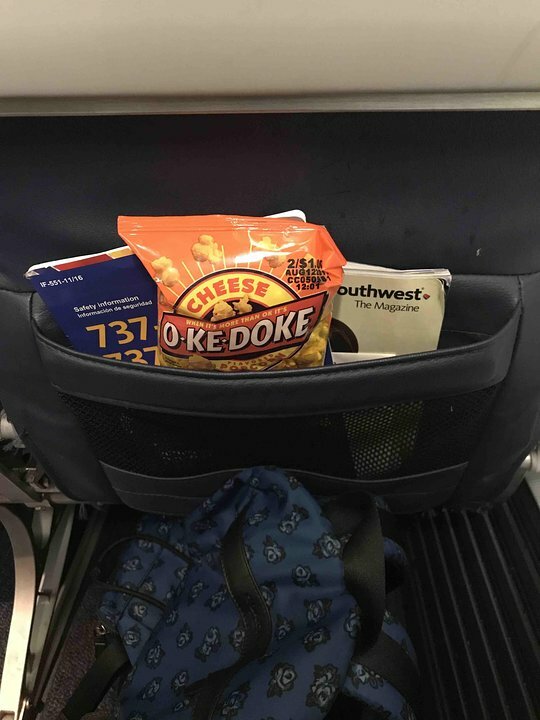 Southwest can say what they like, no matter how you shape your seat, when the person in front reclines and the tray table is almost in your stomach, that is not good. Please note row 10 D.E.F do not recline. I note the 800 series and MAX has moor legroom, thanks God for that. I'm 5' 11" and weight 177lb, so I'm not exactly a large person. Bad move Southwest on the 700, please do not repeat. I am a Southwest credit card member, but if I can avoid the 700, I will fly another airline, hoping I can fly premium economy or something like that. VERY good airline to travel; I can sit where ever I want w/o any assignments and may consider that this airline in the future ^^ ! Bulkhead seats on this plane should NOT be listed as "mixed". They are bad, pure and simple. The only reason for a semi-positive review is "more legroom". There isn't more though. There's just as much in any other row as long as there isn't a bag under your seat. However, the drawbacks of the bulkhead are obvious. There is emergency equipment in the overhead so your bag is likely to be behind you, making deplaning a chore. There is NO tray for your seat. And there is ONE pocket on the wall for all three seats to share. What a horrendously useless seat. After reading reviews of this plane I was a bit worried about the seat. I am 5'10" and more than a bit fluffy. I found I had plenty of legroom (knees did not touch the seat in front of me) and I fit in the seat fine (did not hang over into the seat next to me). I had several inches extra in the seatbelt. I also found the seat to be very comfortable. I was pleasantly surprised and enjoyed my flight very much. The only problem I have with this airline is you can sometimes smell the restroom when you sit in back, kind of like a bus. But that being said you really can't beat it for a flight of up to two hours. If you're flying across the country I like to stop in Denver to break up the trip. Then it's not that bad. I got spoiled on Virgin America DCA-DAL. Now that Alaska has downgauged after the merger from A319s to E175s, wanted to go back to Southwest's mainline 737s. Ugh. Embraer E175s are a dream compared to the sardine can that is these 737-700s. Full flight of 144 pax for a nearly 3 hour flight, and TWO lavatories? I can get that on an E175, with HALF of the pax load. And those new slimline seats? May as well be sitting on a pine bench. I'll be back to booking with Alaska Airlines' E175 service for my future DCA-DAL flights. More legroom than some more expensive airlines. This plane is generally fine. It feels more cramped then the 737-300, which sadly Southwest is retiring soon, and has much less legroom than the excellent 737-800. It's only comfortable for flights of up to about 2 hours. The drink selection on all southwest planes is good, but the snacks are only half-decent. The seat was cold but, it was very quiet and I was the very first to get snacks! I don't fly much but this was my first time flying Southwest and I actually really enjoyed the seat for 3 hours DAL-LGA... paid for early bird then just headed towards the back of a wing which is my favored area to sit. Only thing I would say, Southwest needs charging ports!!! No tray tables in row 1 This row is for disabled people that need more room to get in and out of their seat. You can sit there if you get there first as there is no sign to not sit there. Very good, my first flight with southwest. It does not get cold in flight and also legroom possibly up to 38 inches. Two windows, one on the exit and other one right at next. Big window good for taking pictures. The first row of seats are probably the best. I personally love them if im not in the middle. If you are facing the rear of the aircraft, the first row of seats on the left is used for handicapped people. The first row of seats on the right is overflow for handicapped and then normally, the large people sit there. However, if you can get to it first (before the large people because they will ask you to move if handicapped people need it), it is the best seat on the plane. I'm only 5'2", no legroom even for me. Uncomfortable pitch to the new seats. Aisle also seems narrower. I flew this plane type from Newark to saint louis and to dallas. The seats are okay but Southwest is a low cost carrier so you should not expect much. Over all very tight but the free tv is amazing. Lots of legroom in seats 12DEF. Others are all regular legroom. Except 12a which might not have eaey access to the tray. The seat is nice but regular seat.The engine is near the engine. This seat is perfect for watching the engine. A normal seat here. Has two windows and good view of plane wing. No power? That would be nice if they added that. Oh well overall it was good. Last time i fly Southwest if i could help it, very cramped feeling. Awful!!! 12F has a shortened right armrest and the window placement means you don't have as much shoulder room. Also, 12A does have a tray table, but 11B might steal it from you. Also, 12A has fixed armrests on both sides, so while it's great if you're tall, you will have some issues if you're wide. Though this is an exit row, it doesn't have as much leg room as 12DEF. I am a fluffy flyer and I can't lower the tray table. There's a slender guy next to me but the seats are so narrow that we'll be touching for the next four hours. The seat itself is not uncomfortable though. I fly every summer to either JAX or BQK. Since BQK onlu uses Delta Connection CRJ i prefer to fly into JAX on Delta, Southwest, or even American layingover in CLT. Everyte i fly SW i like seat 24 A. No recline but plenty of legroom. On just over a 40 min. Flight it is rather quiet in the back of the bus so to speak. 5 stars from me! This seat was uncomfortable because of the two windows next to this seat leaving the gap between the windows at your shoulder making the seat to be cramped. The reduced padding really does make a difference. There is not "limited recline." There is no recline at all. Two flights 8 hours in the air and your bottom hurts. However, two seats together really cannot be beat. I'm 6-3 with longer-than-average legs, yet I do OK with legroom on the 737-700. I appreciate the limited recline of the seats, as that what can really cause me problems. I've noticed lately that the seats cause pain in my tailbone -- less cushion? something to do with the pitch/angle? 24D and E are, as indicated, bad seats. They're not as bad as I thought they would be - they're not as loud despite the engines being so close, and the proximity to the galley is also not that big a deal - in fact, we got more individual service from the flight attendants. The big problem is that you can't recline the seat and of course you have to wait forever while the entire rest of the plane deplanes before you get out. For a flight just under two hours (and with no connection to rush to catch), it was tolerable, but I would avoid if possible. Even though I was in boarding group B, I scored with getting to sit in the second row Even though it was a middle seat, legroom wasn't a problem (never is, being 5'2") and I had room to store my large soft-sided carry on bag under the seat in front of me. This flight was very short (Burbank to Oakland), so we basically just went up, had a quick drink, and came down...no reason to fuss about anything anyway. The worst part was that I beat my luggage to the carousel and had to wait a bit for it to be unloaded. 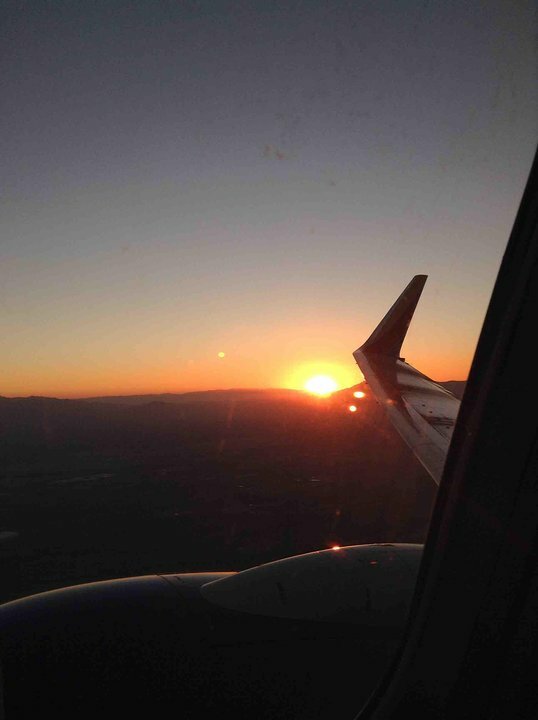 For these short hop trips, Southwest is a good choice. Southwest seats seem to be pretty fair for flights under two hours, though I would hate to be stuck in one of these for much longer. Definitely must try to check in as early as possible, barely made it into boarding group A. Group A is a must have. Flight time just under two hours, solid view out the window, can't complain too much about leg room or seat width, totally adequate for the short flight. Without paying for Wi-Fi, a flight map and TV channels are still accessible. Pretty good deal. Great Service, nice seat, and free wifi! I loved it! Will fly Southwest again! It is very loud in this seat as you are right behind the engines. If you are someone who likes to see the wing during flight (like me) I would not recommend this seat. You are also the second row from the back. There is a air vent on the right bulkhead at the floor level. It emitted condensation which dampened the carpet. My backpack underneath the seat got wet. I have been on this aircraft many times. There is really nothing wrong with it. Its reasonably quiet and has comfortable seating. The seats are a decent width for economy class. I'm 6' tall an the legroom is decent. After about 3 hours it begins to feel cramped but anything under that and it feels fine. Southwest has reliably good service which always makes for a better experience. This seat has a green recommendation. It probably should be a yellow slash green because there is no tray table and the seat is narrower due to a solid metal side to the right and it is cold right next to the exit. I am surprised of all the bad reviews on this plane. I thought the seats were confortable and I had some personal space, too. The flight attendants were very nice and funny sometimes, too. But, the seat I sat in had a slightly misaligned window, but I still had a great view when we took off and landed. I got slightly naucious taking off, however. Overall, I would take this plane again. Southwest stewardess on our flight considers this an exit row. My son has lymphodema and needs to keep his leg straight so we were able to get preboard to get a seat with reasonable legroom (he is 6'5"). Unfortunitley with preboard you are not allowed to sit in an exit row so we were moved. It appears to be a nice seat if you can get it. It was a good flight. Very nice pilots and stewardesses, not cramped at all. 1A,B,C,D,E,F are typically used for wheelchair users or some unable of using the rear of plane. Great view out of the window in this seat as it has two windows for viewing out of. Plenty of room in the seat even with being on the larger side. Seats can be very uncomfortable for someone with a bad back and can make a flight longer than about two hours a struggle. Haven't flown on another airline since back problems started to compare to Southwest but it was the most pain I've been in for months. Return flight from SAN-SMF, at 4:25pm. An aisle seat seems to be a must have on all Southwest flights nowadays. But as long as you're in the front half of boarding group B, you shouldn't have a problem getting one. Surprised to see this route entirely full, I can't imagine there are that many people flying to Sacramento. The chief flight attendant was very comical and enthusiastic, really brought back the cheery Southwest service style. Outgoing flight from SMF-SAN, at 8:05 am. Been a long time since I've last flown Southwest, around 6 years. The cramped seating hasn't changed a bit, but at least the larger overhead bins of the 737-700 can accommodate more modern luggage, unlike those of Southwest's older 737-300s. Flight was very smooth, but didn't get to see the cheery trademarked service that Southwest usually has. As a passenger of size, I am always looking for a seat with as much room as possible. Seat 4F was tight due to the window divider being even with my shoulder. It made the shoulder room noticeably narrower than Seat 6F or 3F where I have sat on other flights. BTW if you are a passenger of size, please follow the rules when flying Southwest. All info is available on their website. This seat was a great seat on my way to nassau the bahamas! Its a great view of the wing and wingtip! The seat is ok for children like UMs but not for adults they are very tight and don't have that much legroom. Also if you try anything you aren't supposed to the attendants WILL see you! over all a good experience. I have flown to Ft Myers many times and the last two were on the reconfigured 737-300. Never again. I have never felt so crammed into a seat in many years of flying. No reclining, To access a bathroom meant moving at least two people into the aisle. One bathroom would not allow lines. Aisle was so narrow two people could barely pass at the same time. Food tray hit my chest; could not be fully extended. A miserable way to fly. Choose rows 2-9 in the front.. window or aisle the 19-24 in the rear.. window or aisle. I am 5.10 average weight and build male and found the aircraft to be ok. The middle seat is horrible on this aircraft. I arrived late and got the last middle seat in the rear. One chunky guy tapped his leg the whole flight and the other stole what little personal space I had. I have flown on both the old 700 interior planes and the newer interiors and I can only tell a slight difference in pitch. However the center of the cabin seems to be cramped to me. Maybe its a illusion. For short flights, 1 - 1.5 hours, Southwest is inexpensive and usually on time. All seats are coach. Also, no assigned seating, so either buy the "Early Bird" check in for $12.50 USD or make sure that you check in 23:50 before your flight to get a low boarding pass number. Seat 24-D did not have the problem with too many people using the toilet. The rear of this plane is cooler, which I like, but be aware if you tend to get cold. Unless your flight is full, the rear of the 737's have empty seats. So if you plan ahead and choose a "Red Eye" flight or a "Crack of Dawn" flight, you should have empty seats and loads of room. I routinely fly from SFO to Tucson (TUS). There is no direct flights from SFO to TUS, so you will change planes somewhere. FYI, if you are a smoker like I am, try to make your transfer at Las Vegas (LAS). You can go into the slot machine booth and have a smoke. At other airports, you will have to leave the security area and re-enter through TSA security, which is a hassle just for a smoke. 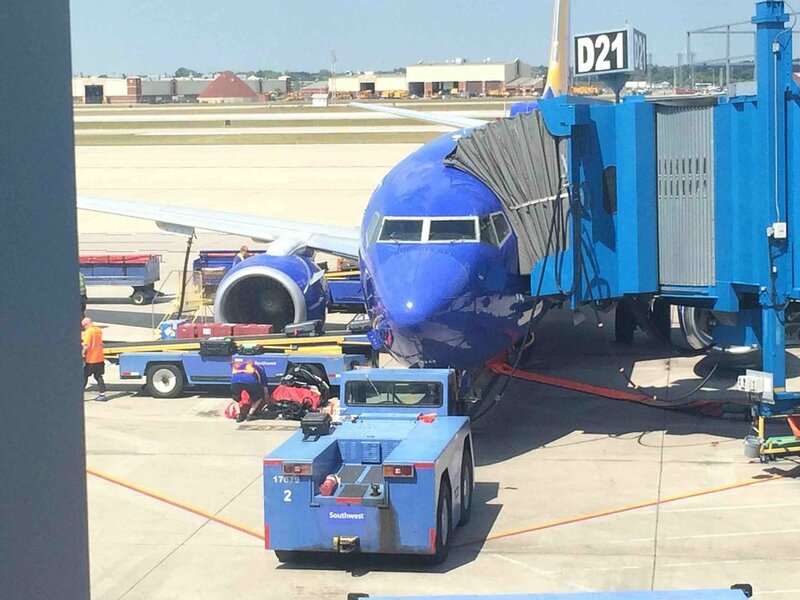 Southwest uses 737 aircraft. The older ones, or "Classic" models, 737-300 have smaller overhead bins. Your big carry-on may not fit, so check what type of 737 model you'll be flying. My husband was in seat 1B. We chose these seats for the leg room. I had a hard time fitting into the seat; I squeezed in like a SARDINE. I had to inhale to use the seatbelt - when I could I flew unbuckled. For the 5.5 hour flight there was NO COMFORTABLE position. I could not use the tray table in the arm. I don't wish to fly SARDINE southwest Airlines again!! I am 6'2" and found the pitch to be comfortable. I had about 1.5 inches between the my knees and the seat in front of me. I didn't feel the need to recline the seat, and most people didn't for a 4 hr flight. The width was tight. My shoulders extended about 1 inch past both sides of the seats. My wife felt a little cramped sitting between myself and another normal sized man. She is 5'4" and petite, so the width leaves something to be desired. The seat cushioning was acceptable. The crew was polite, and even funny at times. I would take this flight again. This seat was very comfotable, service was great, close enough to the restroom but a little more engine noise than expected. Will be trying a seat further forward next time. I had a 4-hour flight from MKE to Las Vegas and the plane was full. We all touched shoulders and had no private space. The tray lowered practically touched my waist. Southwest really needs to study their chair layout and find a few more inches for flyers. The flight was thankfully calm and the stewards did all they could to make us feel comfortable with drink and snack refills. Landing was very comfortable. Very uncomfortable, and I'm only 5'7". This just reeks of corporate greed and letting us know that they could care less. And it's not that I was in the last row; the 1" less legroom makes it really cramped. The seat feels narrower, too. A real drag. One hour flight and my right leg went to sleep. Had to wait for all passengers to exit and call for a wheelchair. I am 6'4" and the thinner cushions and lack of legroom are a medical issue now for me. This is overall a very uncomfortable plane. The 737-800 is amazing, and this is the total opposite. The only benefit of this over the older 737-300's is the availability of wi-fi. You feel very crammed in this plane, even on an hour flight. I have flown SW comfortably on flights up to 2 hours in the past. The new configuration is too cramped for someone 6'5" tall on a 3.5 hour flight. The change to 143 seats has more to do with profit than with protecting the environment. There is no cut out in the bulkhead, but legroom is very decent (probably 36-37") regardless. Oddly enough there is no tray table at all (on the plus side means the seats are normal width) which would be problematic on a long flight, but on the 1 hr hop from MSP-MKE it was a non issue. I found the evolve seat itself to be quite comfortable, though they are definitely packed in too tight except for the exit/bulkhead rows on the -700s. I flew from Houston to Newark and I felt that these seats have decent legroom. It was not that bad, although it felt cramped when you have a tray table out and the person in front of you is reclining. I did not feel that comfortable in these seats compared to jetBlue where there was just so much support. The back support I got was not the best, but then again, its probably the same on any other airline. The new configurations smack of greed and total disregard for the customer. I bought the $12.50 early sign in, and got stuck in a row where the aisle seat was taken by a southwest employee flying for free. I got the window seat and might as well have locked myself in a sardine can. It's a joke and i will never fly this airline again. I read a lot of comments about how uncomfortable the new seats are, but I thought they were fine for our 2 hour 40 minute flight. Maybe if it was a longer flight I would disagree but I did not find anything wrong at all. It was a very enjoyable flight. I fly r/t Newark to Phoenix frequently, am 5'4" and am a slim woman, but I found the seats on this plane to be very cramped and uncomfortable. After 5. 1/2 hours on a full flight, i couldn't get off the plane fast enough to ease the tightness in my legs. I can't imagine how a 6 foot tall person would feel. While the older Southwest seats were more comfortable than typical domestic economy seats due to the 32" pitch, I found the new configuration with 31" pitch to be fine on a long (3 1/2 hour) flight. There was enough space for me to work on my iPad, and decent foot room since the overheads had enough space for all of my carry ons due to Southwest's free checked bag policy. So, not as good as before, but no worse than any other domestic airline. Definitely gets uncomfortable after a while and the recline is less than previous so you still feel pretty upright even in the recline position. I do like the way the rows on each side are off-set so the person across the aisle is not aligned. The new Southwest seats are extremely narrow. Never wide to begin with, the seats on Southwest are now extremely uncomfortable. I had no issue with the new seat cushions, but I will never use Southwest for anything over 90 minutes because of shoulder and arm cramps. The new Southwest seats are much less comfortable than the old ones. I used to fly Southwest all the time, but now with the new seats I avoid the airline, especially for flights over 2 hours. As a United million miler and nearing A-list on Southwest, I can attest that the Evolve seats are indeed very cramped. Southwest used to have among the most comfortable coach seats, now they are near the worst. Rubbing shoulders with the person next to you and rubbing knees on the seat in front is tolerable only on very short flights. I agree, the new seating Southwest is adopting seems to be very cramped compared to other airlines I normally travel on. I swear it seemed like the seat arms were thicker leaving less "hip" room. I asked a flight attendant if they shrunk the seats & he said yes, to make the aisle a little wider & to fit another row or two of seats in the plane. There were three pretty average sized adults in the row & all of us were very uncomfortable for the 2 hour flight from LAS to DEN. Southwest flies 1 versions of Boeing 737-700.